The first fight started in the third quarter, and the whole crowd stood and looked up into the stands like this was baseball and we were following a home run. A good fight too, the kind where you can see one guy winding up from across a stadium. Play on the court was stopped. About six cops swooped in and started beating a kid with night sticks, and they cleared out a big chunk of the stadium. That was the worst mistake the cops could have made, because now the fighting started to spread. “Come on you f**king animals, this is a basketball game!” someone yelled into a microphone. Real calming. After that, there was a scuffle every other basket. Yeah, my girl and I had courtsides to the PSAL Championship game at MSG last night. Boys High vs. Lincoln: Brooklyn on Brooklyn? It was bound to get crazy. 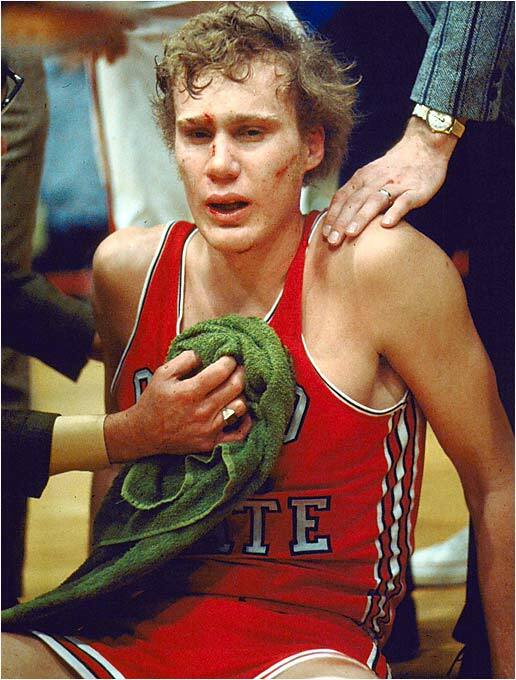 This is a real basketball rivalry, the kind the NBA only remembers. Knicks-Heat, Pistons-Bulls, Lincoln-Boys: these are the kind of match-ups that make sports great. We got there twenty minutes early, and were funneled into an around the block metal detector line by a hundred cops yelling at everyone to take off their belts. It took half an hour just to get into the stadium. “I feel like I’m Palestinian,” I said. “If you were Palestinian, your coat would be a lot heavier,” my girl said. 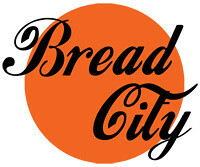 Bread City Basketball: suicide bomber jokes on lock. The crowd was about 14,000 deep with high schoolers, and FLY. Chains, grills, neon all-over hoodies, dream catchers, fur coats, gold-foil t-shirts and camo suspenders were in full effect. And everyone had at least two cell phones. A wild atmosphere. 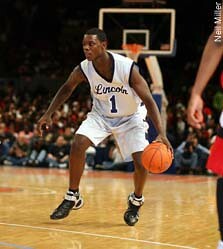 I was personally looking forward to seeing Lance Stephenson, the next-big-thing high school player from Lincoln, and he was pretty good. He never really dominated, but he was clearly a more developed player than anyone else on the floor. Lincoln was in control the whole game. Boys and Girls made it interesting, but were never really in it. My girl and I booked with five minutes left, and I’m glad we did, cause apparently after Lincoln won, the cops herded the whole stadium into 42nd street with horses. Sure, there were fights, but how are you going to expect anyone to act right in the street when you meet them with mounties and SWAT gear? The police classically overreacted to the situation. 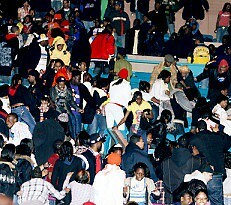 This was not a riot in any way. The PSAL was previously banned from MSG after a brawl in 1964 that ended with whisky bottles raining onto the court. The championship game wasn’t allowed back until 1989. After the game, hundreds of the teenagers descended on Times Square, where there were a handful of fights, some among the teenagers themselves and others with employees of local establishments. In one fight, a teenage girl pulled a hairpiece off the head of a cashier at a pizza restaurant and ran off with it. STARRING: Nate “Gangsta Gangsta” Robinson and Carmelo “Softy Sucker Punch” Anthony.